Before getting EI involved in this story,let's get to know what are these HL7 messages? Why do we need such messages ? From where does these messages come? HL7 refers to a set of international standards defined for exchanging, integrating, sharing, and retrieval of clinical and administrative data between software applications used by various healthcare providers. In simple words HL7 is the common language that is used by different types of health care instruments to talk to each other. Now let's see how these HL7 messages can be received from WSO2 EI using a simple use case. In order to simulate emitting messages from Health instruments, we will be using Hapi Test Panel. If you are not familiar with the Hapi Test Panel you can go thorough this previous blog post about Hapi Test Panel. Messages sent from the Hapi Test Panel will be captured by WSO2 EI's HL7 inbound endpoint and the mediated messages will be saved in a MYSQL database as shown in the below architecture diagram. Note that we are building the above use case starting from the right side of the above diagram. 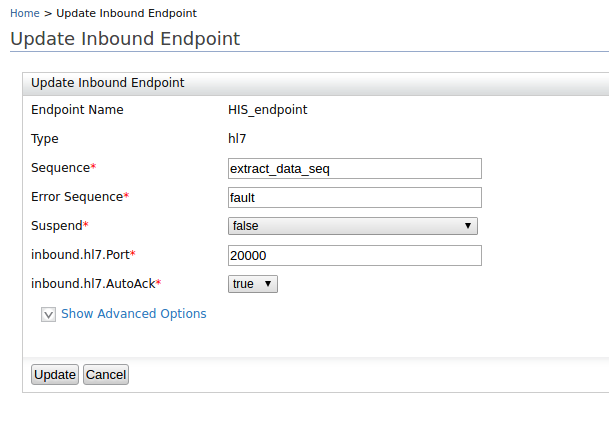 Note : As the purpose of this blog post is to demonstrate the HL7 capabilities of EI and not to deploy in any production environment as is, we will be creating synapse configurations using management console of EI. Let's first create the MySQL table for storing mediated messages. Below given is the sample table that we created in MySQL database. 5. Go through the wizard and generate the data service. 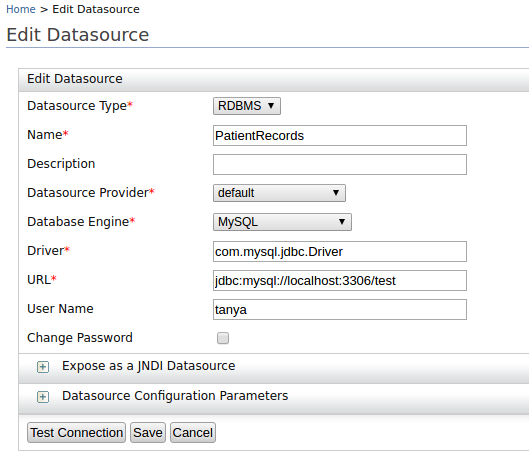 Note the data service name that we have used in this use case is "patient_data_DataService"
Since our data service name is "patient_data_DataService", our endpoint address is "http://localhost:8280/services/patient_data_DataService"
Note that we have used a payload factory mediator to extract data from HL7 message and at the end of the sequence we are calling the data service with the newly built payload. Now go to your MySQL table and verify whether the following entry is inserted. Note that the payload factory mediator is written only to accept messages of type ORU^R01 and version 2.4 and in a real use case we can write the mediation logic in a more generic way to accept differnt type of HL7 messages.